These are vignettes more than stories, fictional thought experiments. They don't particularly tell how characters cope with problems, but simply examine the Dedicated Cavalry of Grand Normandy (motto: "Potentia pro servientes") from different angles, answering various questions about it. In this setting, centaurs are made from normal men. What's that like for the men? How do centaurs feel about horses? 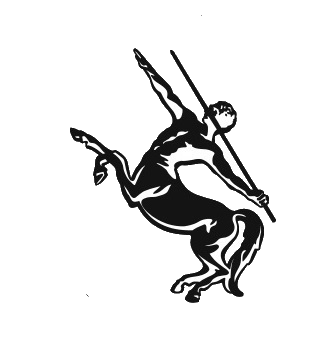 In Grand Normandy, centaurs are made from men who volunteer to be transformed. Why would people do that? A centaur is as strong as a horse and as agile as a man—given proper training. Know thyself. All over again. And know the other guys, too. Our lads are complete stallions below the waist. And it all has to get wired to the brain somehow. Horses sleep a couple of hours a night, plus some dozing. And our lads? To avoid scandal, the DC requires the lads to have routine vasectomies. But they heal vigorously. The officers suspect there was some wish-granting involved in Rene Wardley's transformation. Our lads are not like the soldiers of a mundane nation, where there are always more recruits and the brass can pick and choose. They are expensive to create and train, and there are only a few of them. Cf. the Lapiths and Pholos. How did Grand Normandy come to have the Dedicated Cavalry? Strong as a horse, agile as a man, tough as both together. Magical, too? Cool! They're all horsey, now. But some are horsier. Carlin lies. He lies nobly, but he lies. What happens when the lads go home to the people who knew them before their transformations? John "Buckjack" Weldon goes home for Christmas. Rene "Horsepower" Wardley goes home for Christmas. The transformation spell comes from where, exactly? How much can you change and still have people recognize you as the same person? What will you gamble for a shape? Not all the adults are grown up. The six recruits followed above are only that year's class. Last year, there were different recruits. "What are the odds he knows the word 'cupidinous'?" Sometimes, volunteering is the best bargain you can strike. Transformation and a new career. A time for ... looking forward. They may not be human anymore, but they're still gentlemen. The esoteric economy is happy to use money, but also trades in oath-spells and raw psychic energy (chi, prana, numen, whatever). Given the small numbers in the cavalry, customized contracts might be possible. Horses are matriarchal. The band stallion defers to the senior mare. Standard Cavalry ride Dedicated Cavalry as well as horses. But our lads are not, when you come down to it, horses. Not all the transformations have gone well. The history lecture in "Lecture Hall and Pub" mentions that Prince Hugh, the founder of the Dedicated Cavalry, is still alive but in his nineties, as of 2017. So look a few years forward.